CalliFlower: iotum rebrands its Free Conference Call service with a focus on a rich user experience not only for conference call moderators but also for participants. Value-add in the Web 2.0 world comes primarily through the user interface. There’s a plethora of great technology innovation happening out there. But it’s becoming acknowledged that ease of installation, implementation and operation has been one reason for many services’ success to date, including Skype’s. Yet with only 30-35 million “Real users” out of 300 million registered accounts, Skype has embarked on a new beta program designed to improve on the user experience and ongoing adoption rate for both new users and power users. In the end it’s viral user adoption that builds a business. Last fall iotum launched its Free Conference Call for Facebook service; over the intervening months, participants on iotum’s daily Squawk Box conference call, using their Free Conference Call service, have seen the evolution of a user interface that has set a standard for enriched conferencing services. 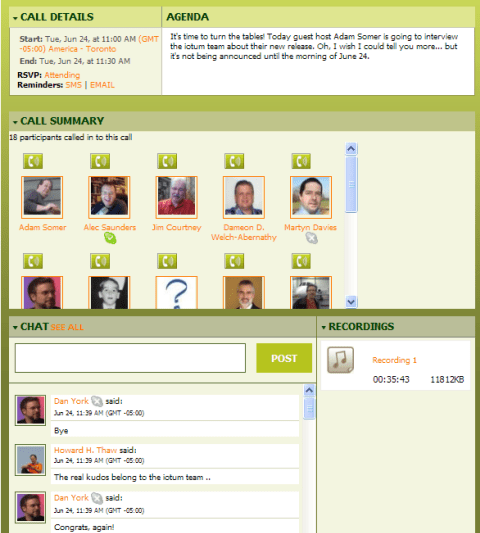 While the host or moderator tools have established call recording, participant management and a comprehensive invitation process as basic requirements for any complete multi-party virtual meeting, it is the interactive participant interface that has made Free Conference Call popular with not only the regular attendees of Squawk Box but have also found Free Conference Call being used for other series of regular Special Interest Conference Call events. But Free Conference Call initially required you to be a member of Facebook; later a separate web-based user interface, independent of Facebook, was introduced to allow participation and hosting outside Facebook. On the participant interface itself we started to see pictures of all the attendees if fewer than 20 participants are in a call; otherwise there is a text indicator. Hand raising, muting and a chat wall all made the calls a richer, more vibrant yet still manageably spontaneous experience. And the calls are stored in perpetuity for later recall. Oh, and, other than being an Unlimited Skype user, I have never paid a cent to attend these Squawk Box calls. (Seven years ago I was paying $200 for a five party, one hour conference call.) Conference calls are as much about organizing, moderating and archiving as they are about the actual call connection. Building on this feedback and introducing additional features, iotum took on a mission to reinvent business conversations. Today iotum launches the beta of its rebranded conference call service, Calliflower, with two user interfaces – one for the moderator and one for the participants – that deliver an even richer user experience. A interactive dashboard for call moderators, calendar integration, a selection of call-in options and an interactive chat wall all contribute to establishing a new benchmark for a complete conference call experience. Calliflower is targeted for small businesses who wish to conduct a more interactive and complete conference call experience for both the moderator and the participants. Their longer term goal is to have “open access” via any social network or any device. Yesterday I saw a demonstration of the service running through the iPhone browser but they are still working on the adaptation to the iPhone format. Certainly Nokia and Blackberry smartphones are also in their sights, provided they have appropriate advanced browser support. But most importantly, iotum has demonstrated that an engaging, interactive, yet simple user interface is key to mass adoption of Voice 2.0 services. It’s also a business fundamental being encountered by other service providers, such as Skype and the revamped SightSpeed for Business about which I’ll be posting in the next few days. Try out a demonstration of CalliFlower here; or sign up and organize your own CalliFlower conference call here. If you have a Facebook account, you can use your Facebook login information. You can access CalliFlower conference calls via SkypeOut; if you have a Skype Unlimited plan that includes either North America or France, that connection comes at no additional charge.. This morning Squawk Box turned the tables. Adam Somer acted as a guest host and interviewed Alec Saunders and Howard Thaw of iotum about the new CalliFlower service and their experiences leading up to its launch. Alec is putting up a recording of the call here (awaiting posting); listen in for more information.